Submitted by mabeldog on Sun, 11/25/2018 - 20:14. Submitted by mabeldog on Tue, 11/27/2018 - 15:38. The last member of the Cardiolgy Dynasty, Emperor Loop, who turned the Cleveland Clinic from a failing hospital into a world wide money making machine reaching it's tentacle$ into Canada, Florida, and the middle East, that sucked up all the real estate for dozens of square miles leaving many poor black people homeless along Euclid avenue, lived with his wife Empress Healy at 710 County Line Road in Gates Mills. Empress Healy died in 2011 of a brain tumor and the Last Emperor died in 2015 of sarcoma. 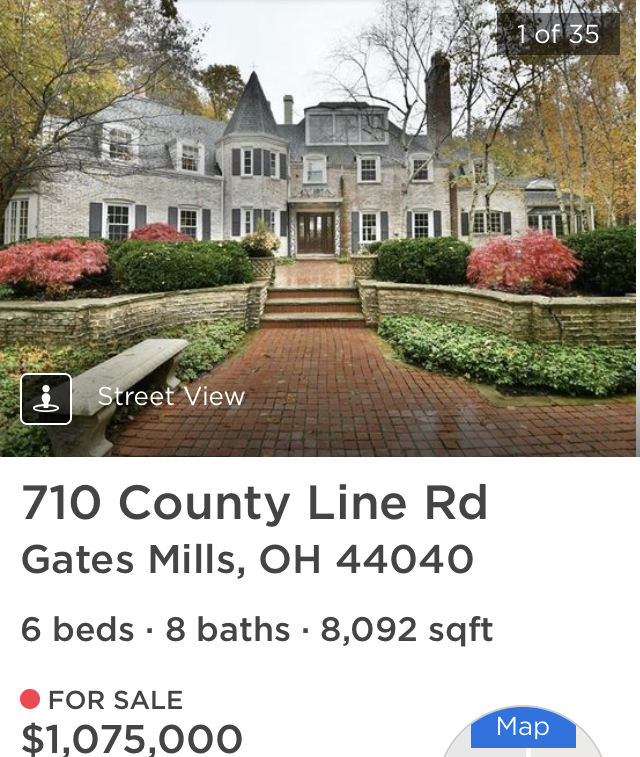 The greedy daughters Regan and Goneril who have never had any intention of living in Northeast Ohio ( not with the fortune THEY inherited) IMMEDIATELY slapped the Castle at 710 County Line Road in Gates Mills on the market for $3.5 million. And they waited and waited and took it off the market and put it back on until finally this summer it sold for $1.3 million to the 35 year old scion of a chop shop/body shop owner on St. Clair Avenue named Anthony Perrino. 10 parcel numbers were mysteriously eliminated and reconfigured in order to push through the sale AND 3 short months later it's back on the market for $300,000 LESS than it sold for in the summer. The bank, First Federal of Lakewood, hasn't received any payments and they want OUT before they have to pay to heat AND maintain it. Plus if you check the parcel numbers that have been retired like 841-31-003, 841-31-004, 841-37-002, 841-31-013 etc. it is very hard to get an understanding of exactly what is going on with the 46 acres surrounded by a moat. So many many parcel numbers no longer exist for undisclosed reasons, including the ORIGINAL parcel number used in the transaction between Robert Munger and the soon to be Empress in 1985. Why??? And the original address of the 8500 square foot single family home was at that time 650 County Line Road. The "new" address of the big albatros now for sale is 710 County Line Road. But on the county fiscal office page that is no building information for that address. WTF?